When the last shift had been skated at Edmonton’s Rexall Place and the Florida Panthers had completed yet another win, an observation came up: “So this is what a really successful road trip feels like.” Florida is 4-1-0 on its current road swing that started in the East and then moved on to Western Canada. Now the Panthers have the chance to transform “excellent” into “spectacular” – if they can win Tuesday night in a very tough MTS Centre in Winnipeg to finish the trip. It’s a game I circled as the toughest of the six. The Winnipeg Jets, the Cats’ former divisional foe, are returning from a 3-game Western swing of their own, having lost to Arizona and splitting shootouts with Los Angeles and Anaheim. Winnipeg collected three points of six and currently occupies the first wildcard berth in the Western Conference with a 21-14-8 mark. And speaking of the Jets, here’s an admission: I watch them. A lot. After they left Florida’s division and conference, I was still drawn to them for some reason. And having no genuine allegiance to any other club in the West, I viewed them similarly as I did when they were in the Eastern Conference, just without the dislike naturally reserved for divisional rivals. 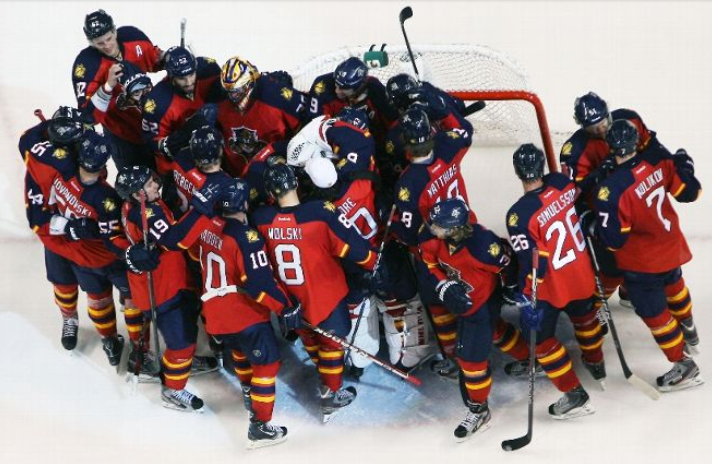 So what are the Panthers facing in Winnipeg, the Slurpee Capital of the World? For starters, they’re facing a healthier squadron of Jets than were available a few weeks ago. Winnipeg has been hit hard by injuries, predominantly on the blue line. Standout young defenseman Jacob Trouba (upper body) is out until next month, while Grant Clitsome (back surgery) is gone for the season. Mark Stuart, Toby Enstrom and Zach Bogosian have all recently returned. Imagine Florida being without five of their six blueliners at one time. Also on the injury front, electrifying winger Evander Kane – expected to be out until February with a lower-body injury – missed just five games and scored against Anaheim in his return. Dustin Byfuglien is as imposing and dynamic as ever, and Blake Wheeler is a personal favorite who leads in assists (21) and sets up top goal scorers Andrew Ladd and Bryan Little, with 16 each. Former Panther Michael Frolik, who will be a UFA this offseason, is having a strong year as well and has found a role with Winnipeg just as he did in Chicago. Goalie Ondrej Pavelec, from the same hometown as Frolik, has always been an obstacle for Florida, but the Cats’ biggest concern likely will be 24-year-old upstart Michael Hutchinson, who was minding the net for the ECHL’s Ontario Reign last year. He’s grabbed the No. 1 goalie spot from Pavelec by going 11-4-2 with a 2.00 GAA and a .931 save percentage. With the Czech goalie having played in Anaheim on Sunday, the money’s on the right-handed catching Hutchinson to be in goal versus Florida, though one never really knows how Winnipeg coach Paul Maurice is going to shuffle his backstops. Winnipeg is 21st on the power play, 10th on the penalty kill, 22nd in scoring, seventh in goals against and 24th in faceoffs. And we all know from those Southeast Division tilts that the MTS Centre is problematic: It’s a small barn, the crowd is often boisterous and the Jets feed off that energy with physical play. A 7-2 drubbing of the Cats there in April of 2013 comes to mind. 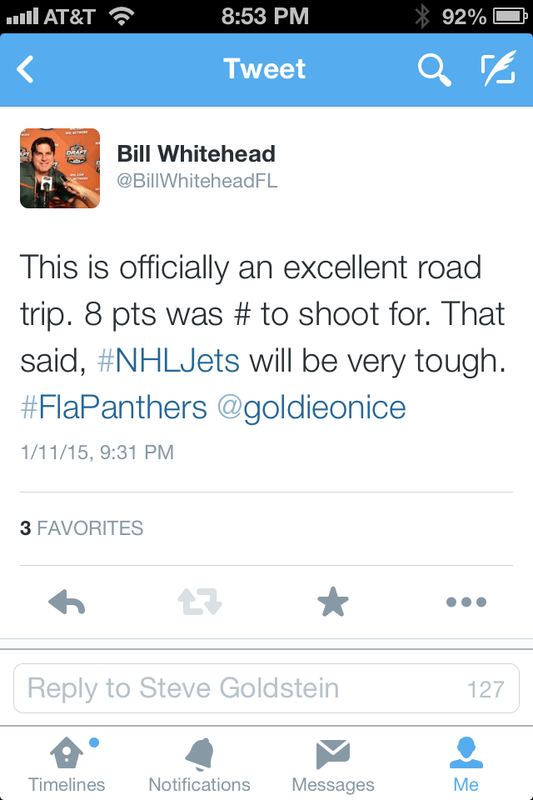 The Panthers will need a pretty spectacular effort to move “excellent” to “spectacular,” but they’ve been doing it this whole road trip and most of the season. It’s just what these Cats do.